A lawful gift deed includes the grantor's full name and marital status, as well as the grantee's full name, marital status, mailing address, and vesting. Vesting describes how the grantee holds title to the property. For Rhode Island residential property, the primary methods for holding title are tenancy in common, joint tenancy, and tenancy by entirety. A grant of ownership of real estate to two or more persons is presumed to create a tenancy in common, unless otherwise specified in the conveyance (R.I.G.L 34-3-1). As with any conveyance of real estate, a gift deed requires a complete legal description of the parcel. Recite the source of title to establish a clear chain of title, and detail any restrictions associated with the property. Record the completed deed at the local Town Clerk's office. 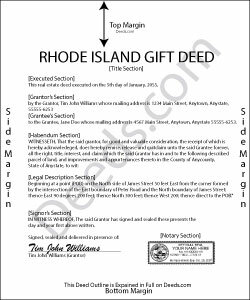 In Rhode Island, there is no state gift tax. When a transfer is by gift, no tax withholding is required, either . Gifts of real property in Rhode Island are, however, subject to the federal gift tax. The grantor is responsible for paying the federal gift tax; however, if the grantor does not pay the gift tax, the grantee will be held liable .